That headline might not be a difficult statment to overcome, considering Doctor Who is on TV this year for a grand total of one episode, but 2016 has seen the release of some of the best Doctor Who stories in years—but they don’t star the current Doctor, and you can only listen to them. Earlier this year Big Finish announced its first ever audio drama series with a main Doctor from the post-2005 era of Doctor Who—The Tenth Doctor Adventures. 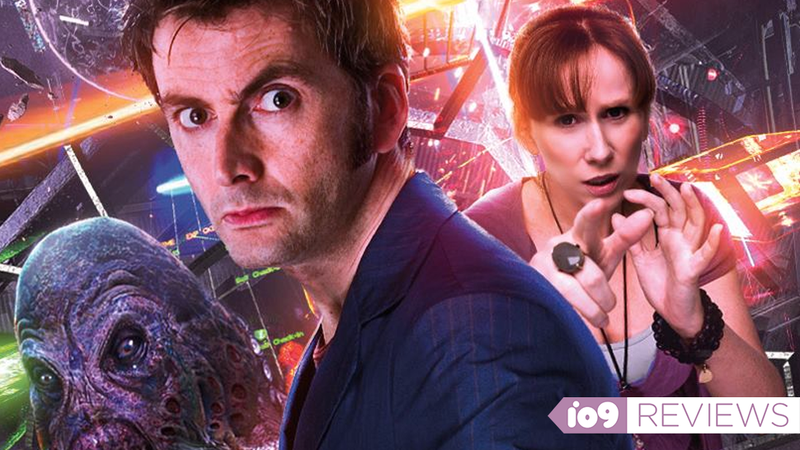 Featuring David Tennant and Catherine Tate reprising their roles as the Tenth Doctor and loudmouthed temp Donna Noble, the trio of new full cast audio adventures does the impossible thing that Doctor Who manages to do every week on TV: make it feel like you’ve actually traveled in time. However, it’s not taking you back to Elizabethan England or a space colony, but a more recent period... specifically, 2009. Ah, the heady days of 2009—the year Michael Jackson passed away. X-Men fans groaned as X-Men Origins: Wolverine hit theaters. A young, upstart scifi and fantasy blog was entering its second year of operation. And on the TV, Doctor Who’s fourth season began, with David Tennant’s Time Lord getting a new companion in the form of Catherine Tate’s Donna. We laughed, we cried, as one of the best duos in Doctor Who history roamed across time and space, helping out Oods and being chased by giant wasps for 13 episodes. The three adventures included in The Tenth Doctor Adventures—Technophobia by Matt Fitton, Time Reaver by Jenny Colgan, and Death and the Queen by James Goss—feel so right amongst the milieu of that season of Doctor Who is practically amazing that none of them come from the guiding hand of former Who showrunner Russell T. Davies. It’s not just that Tennant and Tate slip back into their roles as if they’d stopped filming just days ago—their chemistry just as fantastic as it ever was—but the pace, the writing, the feel of the stories sits perfectly within that very specific period of Doctor Who. Each tale draws on the sorts of stories that defined Russell T. Davies’ house style on the show, whether it’s Technophobia’s alien twist on familiar modern technology, Time Reaver’s cavalcade of aliens just aching to be recreated as rubber monsters á la “The End of the World,” or Death and the Queen’s past-set twist on the “base under siege” concept beloved by the show. But it’s more than just the story frames, the dialogue, and the Doctor and Donna’s banter together,. Fitton, Colgan, and Goss all completely nail these characters and their relationship together, and if you miss that period of the show, you’ll find a welcome return here. If you’ve never listened to an audio drama before, getting used to a story without a visual might seem weird at first—and in some ways, The Tenth Doctor Adventures does lose a little something of the grand, visual storytelling that marked Davies’ time on Who. But if you can put the unfamiliarity of the format aside, these stories are a grand tribute to one of the strongest periods in Doctor Who’s long history. If you’re missing the Time Lord’s presence in 2016, this is the perfect tonic. Just what the Doctor ordered! Doctor Who: The Tenth Doctor Adventures is available to download in its entirety at BigFinish.com for $25 (you can also purchase the three adventures on CD for $49).